My husband and I love having devotionals around the house! They are especially handy when you want or need a quick read for encouragement and don't necessarily have the time to get into a book. 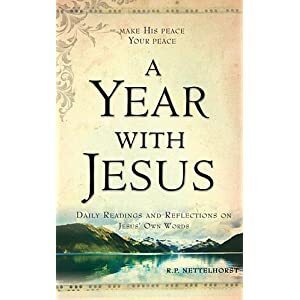 "A Year with Jesus" is a great devotional that we look forward to having around our home. It contains a year's worth of devotions based solely on the words from Jesus that is broken into different topical sections. Each day begins with a piece of scripture, followed by a small commentary written by the author. This is an insightful and easy to read devotional, and while I do recommend Christians read this book, it is by no means meant to be read as the sole quiet time, but rather better serves as a supplement. This would make a great Christmas gift, as this devotional would be ideal to start on January 1st.